Yesterday evening, a leak appeared online at GSMArena (sourced from evleaks and a Chinese blog named digi-wo). It claims to show the T-Mobile US version of the Z1. 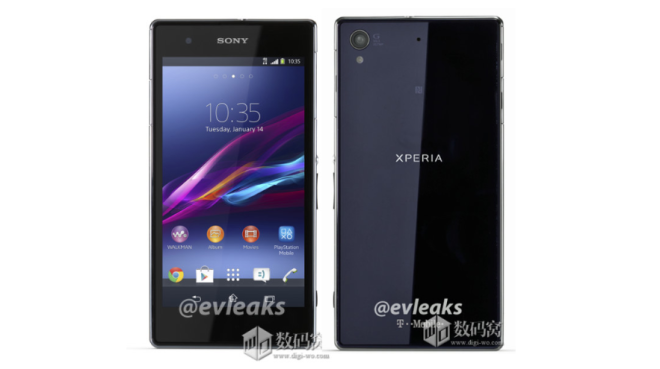 It shows the back and front of the device in good detail, including the 4G logo and Sony-customized Android 4.2. Of course, this isn’t the first time we’ve seen the back of the phone, a leak published in October showed the exact same image. This is the first time we’ve seen the front, as far as I can tell. There are a couple of unusual difference here though. Firstly, the headset jack is much more central, above the SONY logo on the top edge. Secondly, the front facing camera has been moved to the left of the earpiece and not on the right. The official, released model has the headset jack placed much further to the left and the camera on the right. So people who bought the Sony Xperia Z could of held out for the Sony Xperia Z1. Glad I held off. Either way, they are both great phones! This phone should have been released simultaneously at T-Mobile when launched globally September 2013. By the time it’s all said and done, it will be January/February 2014 before we see it on T-Mobile… 4-6 months late. I agree. On top of that, it will still have 4.2 in tow when the Galaxy Note 3 launched in October with 4.3. This is one of the many reasons why companies like Sony aren’t making any money in the mobile space. Samsung has already stated that the Note 3 & the S4 will get it in January as well. I wouldn’t be lauding Sony’s update in front of someone, based on their history they are atrocious at doing any updates. None of their 2012 phones have gotten updates to 4.2 or higher and none of their 2011 phones were ever updated to 4.1. Xperia Z became available on T-Mobile relatively late which caused late launch on Z1 as well. T-Mobile and Sony are trying hard to clear up Z inventory still, so there was no need to hurry for them to launch Z1. Its about time… But now I’m waiting to see what comes out in January. I agree, Sony devices are much better now that they dropped Ericsson as a partner! Another device that will never get past 4.2 w/o a mod…. A picture already leaked showing a red Z1 running KitKat. Sony is rumored to release it in December, maybe even before it comes out for T-Mobile. Sadly you can’t unlock the bootloader without breaking the camera. Otherwise I would own one right now. while I am happy for T-Mobile getting sony’s flagship devices, do they really have to release these variants so far from the launch date? I mean probably by the time this one hits the stores the 2014 flagship will be leaked. I suspect they will release the C6906 model which, again, will not be much use on European LTE bands. So one might as well buy the Nexus 5 for a lot less. Another phone that will sit on display and everyone won’t give a second glance. We can’t even sell the Z.
I’ve sold over 130 myself. It sells extremely well and Sony has the best rep reward program out there. It’s got great specs, a beautiful design and a price that undercuts all the other Android top tier competition. It seems half the Xperia Zs that have left our store come back for one reason or another. I agree its not a bad device but for whatever reason it is something most people don’t even consider. I had about 8-10 of the original 50 I sold come back due to some software glitches. In our shipments since then I’ve had only one or two come back. Honestly though, a big part of its appeal in my store though is its water resistance (I’m in Seattle). I work in a Sony store, & our unlocked XZ versions havent had the issues that the T-mo versions have had. Although I have the T-mo XZ, I havent had any issues with it. I also did the first updates though the Sony software on my computer. Woot! I got Android 4.4 Kit Kat on my Google S4! Arrived last night but installed it now! I think the Ok Google feature doesn’t come with it? I probably don’t know how to turn it on maybe. Plus the app drawer looks the same. Black, unlike the Nexus 5. And your babble has what to do with the topic at hand? Wait What About Sony Xperia Z Ultra? Do you know why I hate this site now that David is gone? It isn’t JUST because Phone Dog screwed him over. It’s the fact that this CAM guy only updates this site infrequently. And at least David would have had a fun post for all us readers for Thanksgiving. David would have made a separate post to wish us all a great Thanksgiving and to eat lots of good food. This CAM guy and Phone Dog has lost all my respect. Goodbye “loyal T-Mobile” fans…. There have been new posts virtually every day. Why wait? The international unlocked versions of Z1 LTE (C6903) and Z Ultra LTE (C6833), both works with the US T-Mo bands. They are even cheaper online than the ones sold in Sony made for US version. do you know where? i really want to get it but on amazon, someone said they got it but not the lte version and im scared of paying for it and it just being the 6902..
Negri Electronics. I got my Ultra LTE from there..
Just be aware that those units sold through Negri will not have any warranty by Sony in the US. If you have any warranty issues, you will need to go through Negri Electronics. With no new news for days, I think I can honestly say that this place is turning into a dump. I know it’s thanksgiving weekend and all but where’s the news? I’m starting to lose interest in a site I used to check multiple times a day. Come on guys!